Lured into Mumbai with only a class X passport and RS 200, Prem Ganapathy had an inauspicious beginning to his journey as an entrepreneur, after being robbed of everything he had. Coming from a poor background, in Tamil Nadu’s Tuticorin district, Ganapathy had no choice but to abandon his dreams for higher studies, in order to support his family and siblings. He first started out doing odd jobs in Chennai, which fetched Rs 250 a month. An acquaintance later offered him a job in Mumbai, with a lucrative salary of Rs 1,200. When he got there, the acquaintance quickly robbed him of the Rs 250, leaving him stranded at Bandra. With no money to go back, he decided to try his luck there, where soon got a job as a dish washer for Rs 150 a month. In 1992, he saved up enough money to start his own business, selling dosas and idlis from a rented cart in front of the Vashi Railway Station. Soon, this small business started fetching him Rs. 20000 per month in profits and he moved into his own food joint from his hand cart. Dosa Plaza is now a Rs. 30 Crore business with a profit target of Rs. 40 crore for the coming year. It has also gone international with more than 10 outlets in New Zealand and the Middle East. So how did he manage so much success in so less time. The answer is “Innovation”. Though not in technology, but in Food. 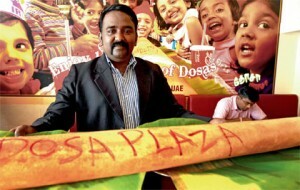 He launched more than 105 varietes of Dosa, not for namesake, but the ones which actually sold. He also kept a serious watch on hygiene (something which most small time food outlets ignore). Apart from this, he brough all his recipes from South – the land of Dosas, that’s authenticity! Being an entrepreneur is not easy. People who start out as entrepreneurs are already one of the most brave people on the planet. But Prem Ganpathy has a different case. He is one of those who has built his business from a time when he did not even have the bare minimum of things at a point of time. All the best to this man in all his future endeavors! Published on February 21, 2012 in Entrepreneurship and Food. 0 Comments Tags: dosa plaza, food, prem ganpathy.